He begins by rolling and re-rolling his material many times to align the clay’s minute platelets and to form a grain. Secondly, the clay is deep-frozen. This causes the water in the clay to expand and to fracture the body. In its frozen state he will attack it with an axe and chisels to shock the core of the clay with percussion and to promote and develop surface features. When thawed, the clay is deflocculated and flaccid. 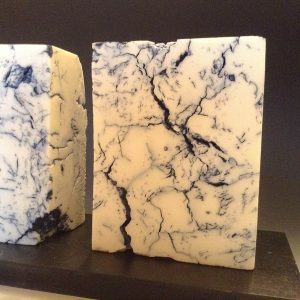 This state promotes the natural melding and bonding of touching surfaces and, with patience and care, it can obviate the need for joining pieces by traditional craft methods. In fact the method emulates, very closely, the formation of rocks in nature and produces fragile welds. 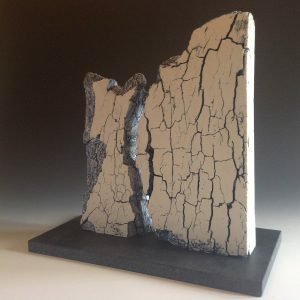 The variety of fractures, fissures and folds in his pieces comes from the effect of repeated freezing and thawing on the layered and laminated clay. After its last freezing, as it gradually thaws and dries, the grain is developed. 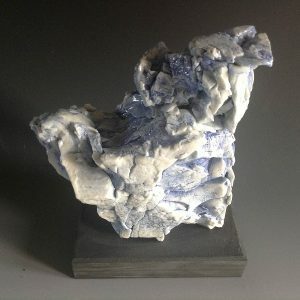 Thus, the work may take viewers of traditional ceramics by surprise. We see no signs of craft working we might expect. None of his works has any semblance of a vessel. Some pieces could be said to resemble rock formations, although their decoration might suggest otherwise. Were it not for the works’ cut and polished surfaces it might be wondered if these pieces were not made but discovered. 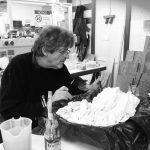 It is clear that, to the artist, the material and the way it is worked are as important as the form. He declares, “ The clay can become more of a record of forces than a conscious effort to make a form.” Indeed, the preparation and the working are an integral part of the form. The surfaces are riven with fissures and fractures such that an exposed rock face might show after centuries of compression and weather-wrought change. 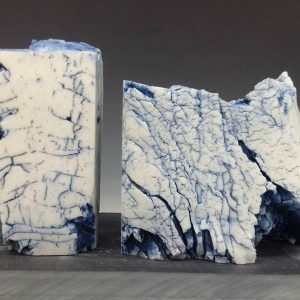 His approach has uncovered the clay’s ability to develop the rich and peculiar variety of shapes and surfaces that might occur only in a range of rock faces or ice walls. The sense of emotive monumentality in such faces is a part of the appeal of McGowan’s work. 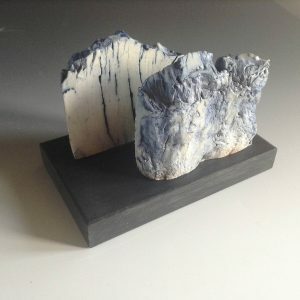 In his early work in porcelain he has decorated the surfaces so that the colour appears to have bled from within the clay whilst the Parian pieces, which carry many tiny filament-like fissures, have colour which appears like a rain-pattern wriggling on the stark-white, smooth ceramic. We may find ourselves tentatively touching the surfaces to help us make sense of what it is we think we see. Effects and forms that he is able to generate serve to highlight the medium’s versatility. 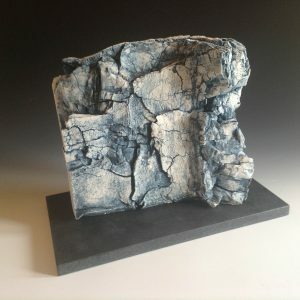 The fascination here is the same as it may be with many forms of ceramic: surfaces which appear friable, peeling, delicately fragile or contorting are all fixed by fire in the pure stone-like porcelain. . 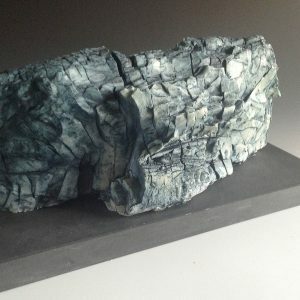 In McGowan’s work we witness a form of expression which has enabled him to find a voice within the clay and in so doing to create ceramic sculpture which is both timely and forward-looking.